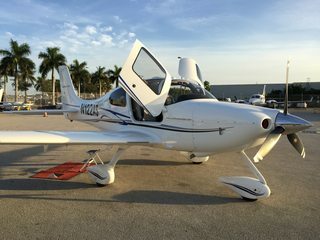 The Cirrus SR22, designed by Cirrus Aircraft Company, is the best four place single-engine airplane to provide on-demand aircraft charter flights to our Florida clients. The Cirrus SR22 is roomy, fast, and has many industry leading safety features that are now common in general aviation airplanes. No wonder its the best selling General Aviation Aircraft with over 6000 airplanes produced. The moving map and flat panel displays that once were found only on modern airliners are standard on the Cirrus SR22. Plus the Ballistic Parachute for the whole plane adds a level of safety found on no other commercial airplane. Our charter customers often mention how they feel safer knowing the parachute is there. I know you will too. The Cirrus SR22 is comfortable and has big windows. It’s wide enough so you don’t rub shoulders with another passenger and has a high ceiling- I’ve flown passengers 6ft 5in tall and they had room to spare. You and two others can sit comfortably while en-route to your business meeting. The Bose headsets allow you and your associates to talk privately, listen to satellite radio or Air Traffic Control. It’s a great way to get around Florida for business or personal trips. Time is your most valuable asset. Charter our Cirrus SR22 and you’ll save lots of time better spent growing your business or spending time with your family. Plus you’ll love the experience.